Regrettably these New Zealand Lord of the Rings coins sold out long ago, however most are still available on the secondary markets including reputable coin dealers and auctions sites such as eBay. Links to coin auctions on eBay.com, eBay.co.uk, and eBay.com.au sites are shown below. This information was previously located on our earlier http://www.lordringscoins.com and http://www.lord-rings-coins.com/ websites. To coincide with the release of The Return of the King in December 2003, New Zealand Post in conjunction with the British Royal Mint, issued a series of limited edition Lord of the Rings Collector's Coins to commemorate Peter Jackson's The Lord of the Rings movie trilogy. Unlike previous Lord of the Rings medallions, these New Zealand coins were legal tender, but given their expected popularity are unlikely to be available for long let alone in general circulation. Chief designer of the coins is Matthew Bonaccorsi who crafted the reverse engravings, while the obverse features the official portrait of Queen Elizabeth II by Ian Rank-Broadley. Struck in 999 fine silver with Elvish script over a frosted background that sets off a polished and gold plated "One Ring"
First release in the 'Scenes in Silver' Proof series will be an eye-catching design featuring a gold-plated "One Ring" in relief over a frosted background. Another five silver proof designs are expected to be released between now and mid-2004. Number struck is 150,000 but whether this includes all six designs has not been confirmed. Struck in Cupro-nickel with character portrait over leaf flourish background. 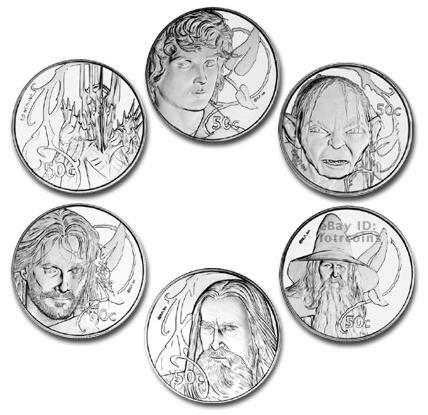 Set of six portrays conflict between Good versus Evil and includes Aragorn, Frodo and Gandalf facing Sauron, Gollum, and Saruman. Struck in 22 carat rose gold with Elvish script over a polished background that sets off the "One Ring"
With the immense popularity of The Lord of the Rings demand for many of these coins was extremely high and exceeded the limited number of coin sets available for purchase. Designs of the Lord of the Rings coins will be announced in November along with date of issuance which is expected . These officially licensed New Zealand Lord of the Rings coins have been approved by the Reserve Bank of New Zealand and authorized by New Line Entertainment. Coins will be minted in cupro-nickel, silver, and gold in denominations ranging from fifty cents to ten dollars featuring leading characters from the movie trilogy, and will be available individually, and in a range of presentation packs. Three different Gold Proof Coins will be available in a staggered release beginning soon. Number to be struck is 15,000 but whether this includes all three designs has not been confirmed.